Infinity® Super Skybox™ transforms up to four standard Infinity Skybox units into a shared, bank-wide display spanning across each cabinet’s 55” vertical monitor to create one unified overhead display, leveraging a groundbreaking game-to-game communication and video director technology. 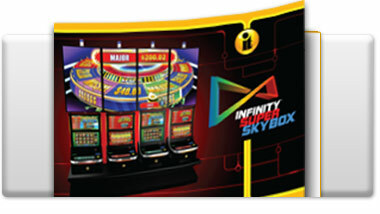 Infinity Super Skybox features high visual impact and a compelling digital attract mode. Infinity Super Skybox game families include Super Sky Wheel™, which expands IT’s flagship brands with the addition of a huge overhead wheel. Available game titles include Money Rain® Super Sky Wheel™, Money Roll® Super Sky Wheel™, Crazy Money® Super Sky Wheel™, and Winner of the West® Super Sky Wheel™. 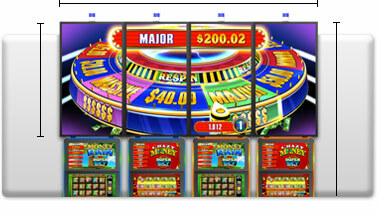 Celestial Goddesses™ brings the Solar Jackpots™ game family to life by utilizing the Super Skybox screen to display a huge overhead sun that triggers random wild events on the base games below An exciting addition to the Super Skybox family is Big 3 Hypersonic™, an easy to understand title with a traditional casino theme with innovative twists including a free spin event on a giant video reel set overhead simulating a one line mechanical reel game.